Install custom carpeting in your Minnesota and Wisconsin basement that won't grow mold or collect moisture. At DBS, we can provide you with ThermalDry® Basement Floor Matting - a waterproof, subfloor product designed specifically for basement finishing. For a free basement remodeling quote in Duluth, Superior, Minneapolis or nearby, call us today! We are Duluth Superior Area's local basement finishing contractor with custom carpeting options. ThermalDry® Floor Matting, available in Minnesota and Wisconsin by DBS, is an appropriate subfloor when installing wall-to-wall carpeting or padding in a finished basement. These award-winning interlocking tiles create a vapor barrier on your concrete floor that will keep humidity from affecting your custom carpeting on top. These tiles are compatible with tack strips, and should outlast several generations of basement carpeting. If you would like a free estimate, call us today! 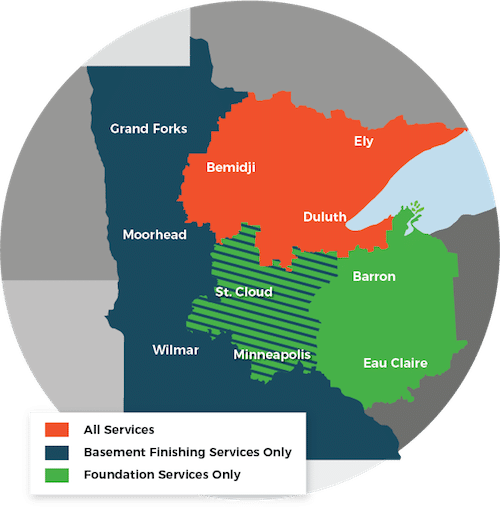 We serve the Minnesota and Wisconsin area, including Superior, Duluth, Minneapolis, Two Harbors, Cloquet, St. Paul, Hermantown, Virginia, Ashland, Esko, Hibbing, Proctor, Eveleth, Grand Rapids, Hayward, Eau Claire, Bemidji and nearby.